Starz held their New York Comic Con panel for the hit series Ash vs. Evil Dead yesterday, and with the second episode of Season 2 debuting Sunday night, it seems the show will be sticking around for at least one more season. A new report reveals that Starz has renewed Ash vs. Evil Dead for a third season comprised of 10 episodes, just like the first two seasons. The news has yet to be confirmed by Starz at this time, but this doesn't come as much of a surprise, considering the ratings for the Ash vs. Evil Dead Season 2 premiere. Deadline reports that the Season 2 premiere pulled in 733,000 viewers over all its airings on Sunday, October 2. Those numbers represent a 14% increase over the Season 1 premiere on Halloween last year, and in the adults 18-49 demographic, the Season 2 premiere increased a whopping 63% over the series premiere last year. Those numbers are even more impressive considering the Bruce Campbell series returned on the same night as HBO's three highly-anticipated shows Westworld, Divorce and Insecure debuted. Starz also held a marathon of Ash vs. Evil Dead Season 1 episodes on Saturday, October 1, a day before the Ash vs. Evil Dead Season 2 premiere. 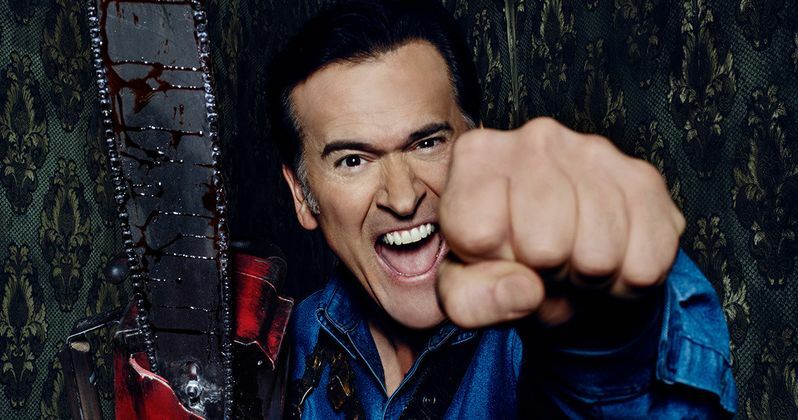 Series star and executive producer Bruce Campbell also made headlines this summer by starting his own one-man Emmy campaign for the hit series, although it didn't actually result in any Emmy nominations. Still, the show's fan base is clearly growing, as per the numbers from last weekend's Season 2 premiere. Since Season One, Ash Williams has been living it up in Jacksonville with his loyal sidekick Pablo and revenge-filled Kelly. Ash vs. Evil Dead Season Two kicks off with a double-deadite battle royale interrupting the party, Ash is forced to return back to his hometown of Elk Grove, Michigan... and as always, Evil follows him. Sam Raimi serves as Executive Producer with Rob Tapert (Evil Dead, Spartacus, Xena: Warrior Princess), Bruce Campbell (Evil Dead, Burn Notice) and Ivan Raimi (Drag Me To Hell, Spider-Man 3) along with Craig DiGregorio (Workaholics, Chuck) who serves as Executive Producer/Showrunner. Aaron Lam (Spartacus) and Moira Grant (Spartacus) serve as Producers. The cast is led by Bruce Campbell (Evil Dead, Burn Notice) in the role of Ash Williams; Lucy Lawless (Salem, Spartacus) as Ruby, who now possesses the powerful Necronomicon; Ray Santiago (Touch, Meet the Fockers) as Pablo Simon Bolivar, Ash's loyal sidekick dealing with the trauma he suffered in the cabin; and Dana DeLorenzo (A Very Harold & Kumar 3D Christmas) as Kelly Maxwell, who, grief-stricken after the death of her parents, plots revenge against The Evil Dead. Lee Majors (The Six Million Dollar Man), Ted Raimi (Xena: Warrior Princess, Spider-Man) and Michelle Hurd (Law & Order: SVU) join the cast this year as Brock Williams, Ash's father, Chet Kaminski, Ash's childhood best friend, and Linda, Ash's high school love, respectively. The next episode of Ash Vs. Evil Dead, The Morgue, airs on Sunday, October 9 on Starz.